The “Super Tuscan” wine region of Italy has been one of the most innovative and dynamic, for over 30 years. This is where “Super Tuscan Wines” were born; the land of Sassicaia, Tignanello, and Ornellaia. In the last few years, there has been an explosion of tiny “garage” style wineries making some of the world’s best (and most expensive) wines. We are pleased to offer our wine loving clients a chance to visit Suverto as a day excursion from the Tuscan art cities of Pisa and Siena. On this wine tasting adventure, you will visit two top estates and enjoy lunch at one of our favorite gourmet haunts in Italy, located in an 800-year-old converted olive mill! You will travel by luxurious Mercedes sedan or comfortable van and will have your own private guide for the day. This is the Dolce Vita, sit back and enjoy! Lunch in a 13th Century "Frantoio"
9.00 a.m. Your private chauffeured Mercedes will collect you at your hotel in Pisa or Siena. From Pisa, you will transfer south on a fast road that hugs the coast for part of the journey. The drive to the Maremma wine region from Pisa is an easy hour drive. 10.00 a.m. Visit your first Super Tuscan estate such as the mythical Ornellaia Estate located in the little wine hamlet of Bolgheri. You will receive a VIP private visit, and enjoy a vineyard walk and cellar tour before a phenomenal wine tasting. 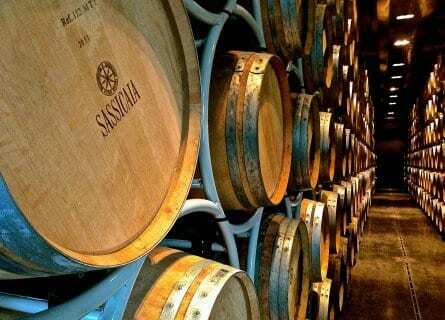 Enjoy a stellar Tuscan lunch at the Sassicaia wine estate Tenuta San Guido, fabulous. After a convivial lunch, you will head to the second winery of the day. The next visit may be the fabulous Petra, located near Suvereto. Designed by renowned architect Mario Botta, Petra is architecturally stunning and a complete contrast to Ornellaia. The wines are exceptional as well, and after your private VIP tour of the estate you will sit down to a tasting of their flagship wines such as Ebo, Quercegobbe, and Petra. You will also taste their superb olive oil. Alas, your day comes to an end. You will transfer from Suvereto back to Pisa (or Siena) and this will conclude you luxury wine tasting excursion with Cellar Tours. Elisabetta was exceptionally knowledgeable and we enjoyed her company very much. We certainly would recommend your company to others.